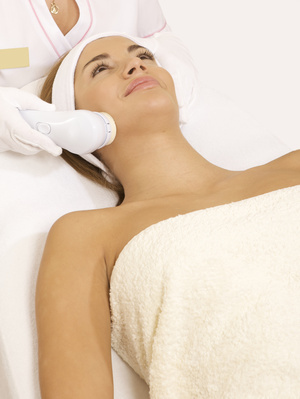 Ultrasonic is a new technology for facial rejuvenation and improvement of dark spots. The treatment uses a unique combination of electrical energies to stimulate the production of new collagen and to drive topical treatments into the skin. The ingredients in it are selected for specific purpose and contain pigment lighteners, antioxidants, collagen stimulants and moisturizers. It is more effective than simply applying them to the skin because the ultrasound component helps to drive it in to penetrate deeper than just topical application. It helps repair damaged skin. It is safe for all skin types.